In this installment of the current storyline (which began in issue #153), we finally learn the identity and origin of the “impostor” Captain America and Bucky. Aside from the insights we get into the other Cap’s character—as well as “our” Cap’s reaction to him, on which more in the next issue—this story is a classic retcon in the original sense coined by editor Roy Thomas (who inspired this particular story), reconciling past and present continuity with minimal changes and reaffirming the integrity of the Marvel Universe, rather than changing established story details in an attempt to “simplify” matters for new readers. The issue opens on the “real” Steve Rogers and Sharon Carter, enjoying a long-deserved vacation in the Bahamas, and teaching an important lesson about the importance of sunscreen. As many have in the past, the impostors use a glimpse of Cap’s fallen sidekick to lure him into a trap. Gullible? Sure, but understandable. After subduing the real Cap, the impostor Cap puts his shorts on and tries to fool Sharon, but she picks up pretty quickly on the fact that he’s not her Lobster Man, and soon she and Sam (who has since arrived) fight the two impostors, scoring points on the Hitler-hate connection. Having beaten all three of our heroes, the impostors load them on a plane, and once in the air, the mysterious Cap reveals his true identity and origin. Before he tells his story, a little background if I may. Captain America’s Golden Age comics appearances ran from 1941-1949, with another brief run in the mid-1950s (that is collected in this trade paperback). But in Avengers #4, we learned that Cap and Bucky disappeared after a battle with Baron Zemo in April 1945, just before the end of the war, which naturally leads to a question: Exactly who was the Captain America in his appearances in the late 1940s and the 1950s? We’ll learn the identity of the late-40s Cap in later comics, but the 50s Cap is the one we have met in this storyline. 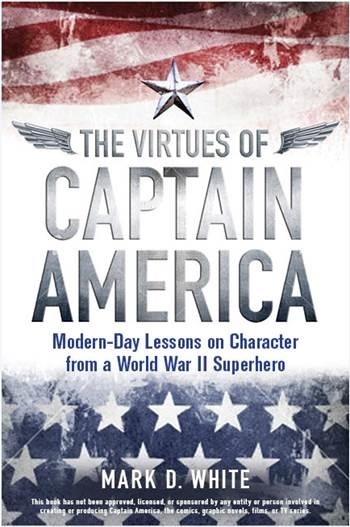 Well, anyone who writes a book-length study of the original Captain America can’t be all bad! In his later research, this guy—who will remain nameless until Captain America #602 in 2010, despite several more appearances between 1972 and then—stumbles upon the formula for the super-soldier serum that, along with the Vita-Rays), transformed Steve Rogers into Captain America. When he takes it to Washington, it is not without a personal agenda (with which many of us can sympathize). The next step, though, is a bit over the top, even for comics (although people in the real world have gone this far to look like their idols). But seriously, who’d want to look like this mug? When this new “Bucky”—whose name is revealed much sooner, in Captain America #281 in 1983—gives the 50s Steve a Cap costume, he turns it down, but reveals that his heart is in the right place… for now. The shadows on the wall, straight out of a “Dr. Jekyll and Mr. Hyde” movie, give us a clue what has gone wrong here. …they soon lost track of who were the true threats to America, and began to see threats in anyone who didn’t look like themselves. Of course, it was a person enraged by political developments in 1972 (especially that well-known communist sympathizer Richard Nixon) who defrosted the 50s Cap and Bucky, and set them on their present path, including pursuing the real Captain America, whom they took to be an impostor himself. Back in the present, we learn how Sam first realized the 50s Cap was not the Cap he calls friend… bot the contrasts are even more stark given the former’s behavior. After the 50s Cap returns to the cockpit of the plane, the real Cap reveals how shaken he was by his successor’s story. He also acknowledges that even if the 50s Cap does not bear moral responsibility for his behavior, due to his mental illness, he nonetheless represents a danger that must be stopped. We’ll see more of the real Captain America’s anguish over his “other side” in the final issue to the storyline in our next post.